Eggs and flour transform chocolate-hazelnut spread into subtly sweet, cakey brownies. Preheat oven to 350°. Line an 8"-square baking pan with foil. In a large bowl, whisk together chocolate-hazelnut spread, eggs, and ¼ cup water. Stir in flour and salt, and transfer to prepared pan. Bake until just set around the edges, 20 to 25 minutes. Set aside to let cool completely. Using foil to lift them, remove brownies from pan. 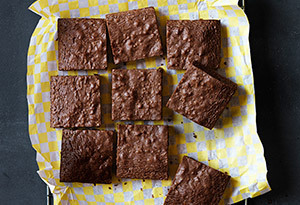 Cut brownies into squares, discarding foil, and serve.